The province of Quebec is a bit like a perpetually petulant adolescent. It's now going through one of its periodic identity crises or nervous fits. Twenty years after the first referendum on independence of 1980 and 15 years after the second unsuccessful attempt in 1995, Quebec feels misbegotten and frustrated once again. What's still left of the once glorious sovereignty movement of yesteryear is graying and dying out. Demography is crowding out the separatists. New immigrants are far more preoccupied with finding work or making a living than lofty dreams of sovereignty and flag waving. They have populated the province in substantial numbers over the decades. Meanwhile, the provincial political scene is mired in endless scandals revolved around influence peddling. Media reports center on inferences of wrongdoing or relate details of the elected leadership's unsavory ties to less-than-legitimate organizations. Amid this crisis in confidence, attributed to Quebec's ruling elite, politicians have lashed out against the press. 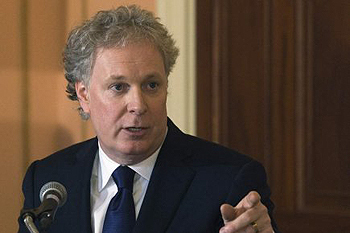 Quebec Premiere Jean Charest was this week particularly peeved over the conclusions made in Maclean's, suggesting the province, if it were an independent state, would more than likely do very poorly in a "transparency international" ranking on good governance and stewardship of the public purse. Like an irate potentate, he publicly demanded an apology from the magazine's publishers, and got one. "La Belle Province," physically speaking, is not looking so lovely these days. Forty years after the "Quiet Revolution" there's a sense of irreversible decline. As its population gets older, the province's infrastructure—roads, highways, bridges and overpasses, urban transportation networks, waterworks—is showing its age. Montreal, the laboratory for social change in the province, exemplifies the shabby state of affairs—a crumbling that matches the political scene. Quebec's politicians—Liberals (the provincial-federalist) and Parti Quebecois (separatist) in Quebec City and Bloc Quebecois (federal-separatist) in Ottawa—have all reacted in unison, with all three parties forming an alliance to bewail and denounce allegations made in the Maclean's article. Have any of them contemplated the possibility that perhaps there may be a problem here, that there may be some truth to the media reports? One possible reason for the coordinated, feigned outrage is that the ruling elite has nothing new to offer the electorate anymore. They offer more politics of the same divide-and-conquer variety to keep the people lulled in a state of complacency. In the Maclean's case, the attack is really a counterattack on the ever-perfidious ROC (Rest of Canada) or nasty "Anglos" living outside the province. Quebec's politicians, this time around, are not targeting their favorite punching bag, the federal government, maybe because they love the current prime minister too much. Instead they have chosen an easy target to vent their frustrations and deflect popular discontent: a nationally circulated news magazine that seems to embody (for now) all that is unholy about Canada as they know it. The article in question has re-launched the perpetual bickering between the two old founding nations of Canada, that is, the French and English majority (soon to be minorities in the coming decades it seems). The timing is not great, as the entire country (including sacrosanct Quebec) is faced with very difficult challenges, such as dealing with the deepening economic crisis; issues related to immigration (rising influence of non-European cultures); and a lack of competitiveness, as it's being out-performed and fast overtaken by nations such as Brazil, India and China in hi-tech industries, resources production and extraction industries. The question of language, another contentious issue that in the past dominated the national agenda for decades, is now a secondary, marginal issue. Yet the allegations and accusations of corruption in Quebec have revived old resentments and deep-seated hostilities. Whether they are true or not must be addressed if the provincial government wishes to maintain any semblance of credibility among the populace. Politicians in both Ottawa and Quebec City seem reluctant to address issues related to the dirty c-word. Instead, they prefer to blame the media, Anglo-Canadians or whoever dares to disagree with their ways of doing things, while perpetuating the same old historical divisions that nearly broke up the federation twice in the long-ago but not-yet-forgotten past.